The bus stops marked with orange circles will be temporarily moved. The contractor has requested to move two bus stops while utility undergrounding work is underway. Notices will be posted at the existing stops alerting bus riders of these temporary moves. 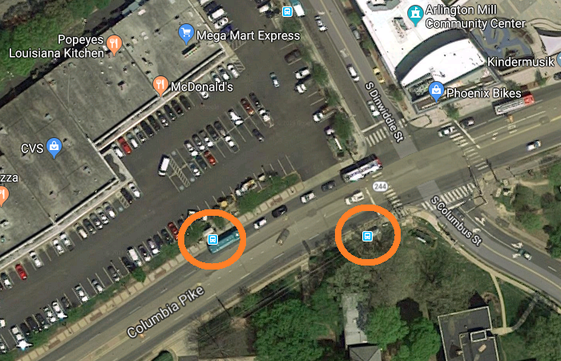 The eastbound bus stop and shelter at the southwest corner of Columbia Pike and South Columbus Street will be relocated east near the 7-Eleven. The westbound bus stop at Columbia Pike and South Dinwiddie Street, next to the Columbia Pike Shopping Center, will be relocated east to a parking bay on Columbia Pike in front of the Arlington Mill Community Center. Drivers will be prohibited from parking at this location and signs will be posted. > and the partner non-for-profit Resilient Virginia<http://resilientvirginia.org/>. For more information, call the Housing Division at 703-228-3765, or the Home Expo team at 202-599-0665. Jorge Laura, Housing Outreach Program Coordinator COMMUNITY PLANNING, HOUSING & DEVELOPMENT (CPHD) 703-228-3827 | jlaura@arlingtonva.us<mailto:jlaura@arlingtonva.us> | www.arlingtonva.us<http://www.arlingtonva.us/> Any email sent to/from Arlington County email addresses may be subject to disclosure under the Freedom of Information Act (FOIA). CPHD Mission - "Promoting the improvement, conservation and revitalization of Arlington's physical and social environment. The County continues to build on the bicycle’s unique ability to provide clean short- and medium-range transportation that requires far less infrastructure and resources compared to automobile traffic. The investments continue to pay off. Bicycling magazine recently named Arlington the 17th best biking “city” in America — a jump from 25th in just two years. And the pace continues to pick up for Arlington’s expanding bikeways. 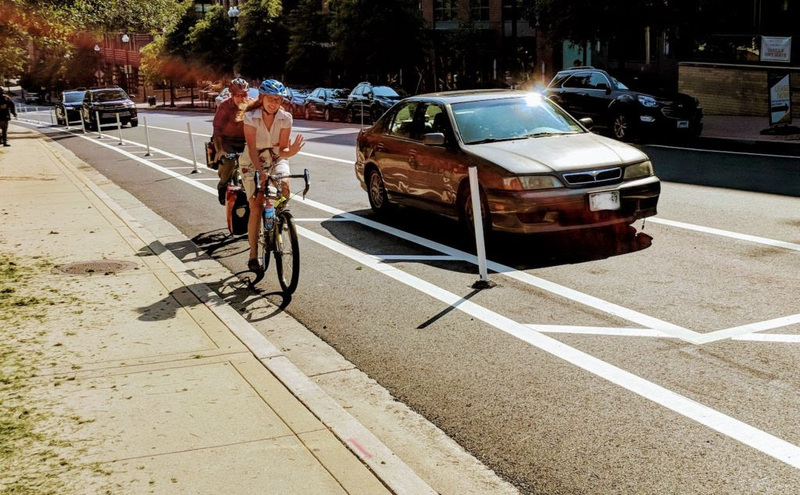 Last summer, three different protected bike lanes opened in Arlington in consecutive weeks including the new lanes on Veitch Street in Courthouse, which were voted 2018’s Best Urban Street Redesign on Streetsblog, the transportation and smart growth news site. As part of annual street repaving, Arlington also debuted its first contraflow lanes, allowing bicycle riders on 9th Street South and 12th Street South to travel in both directions while motor vehicles are limited to one way. These new lanes connect important gaps in the existing bike network. As a County with limited room, Arlington continues to look for opportunities to expand its bikeways network while meeting the needs of a variety of street users, including pedestrians, drivers and businesses. Whether someone bikes or drives, he or she has the same rights and responsibilities on the road. Being Predictable, Alert and Lawful is recommended behavior. Bike lanes, including those protected by bollards and parked cars, are set aside by County Code for the use of people biking. Motor vehicles may enter a bike lane but solely to make turns and access legal parking spaces. Arlington County Police are committed to ensuring the safety of all travelers and uses a two-pronged approach to improving transportation safety County-wide: education and enforcement. When drivers, bicyclists and pedestrians are educated on the laws that apply to each other, a mutual understanding of responsibilities builds for all. With more people out walking and biking this time of year, police are participating in the regional Street Smart campaign April 15-May 10 to remind travelers to slow down, remain alert and proceed with care and caution. As part of the police department’s transportation safety program, officers conduct traffic enforcement at designated areas on a random rotating basis with the goal of compliance, even when police are not present. 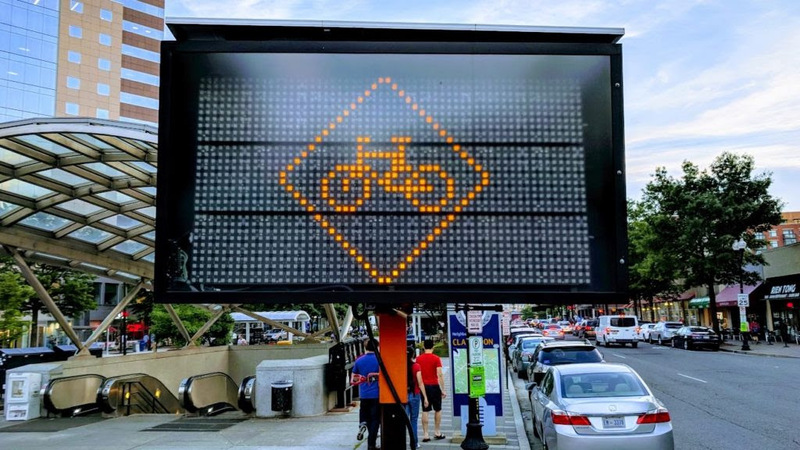 Reports of in-progress traffic or parking hazards, such as bike lane violations, should be reported for investigation by calling the Emergency Communications Center at 703-558-2222. The updated Bicycle Element of the Master Transportation Plan, representing the County vision to continue growing the bicycle as a transportation option by 2040, will be considered by the County Board at its April meeting. The update incorporates some 125 Arlington bikeway network projects and may be amended over time. In January, Metrorail began allowing riders to bring bikes aboard at any time, ending the longstanding prohibition during rush hours. Capital Bikeshare topped 500 docking stations region-wide (nearly 100 in Arlington), including docks installed last year at Theodore Roosevelt Island and Gravelly Point. Capital Bikeshare is expanding its electric-assist Bikeshare Plus fleet to 500 bikes, up from the pilot program of 85 launched last fall. There are even more options for expanding two-wheeled transportation in Arlington. The seemingly ubiquitous Shared Mobility Device demonstration project continues to test the impact of dockless electric-assist bicycles, as well as e-scooters, owned by commercial operators. A formal period for public feedback will take place in May and June. With silver status as a League of American Bicyclists Bicycle Friendly Community – no Virginia town has achieved gold – Arlington’s reputation for biking only continues to build. Whether a bicycle is used for year-round primary transportation or a first-time attempt on Bike to Work Day (May 17), Arlington continues to move biking ahead as a healthy, accessible way to get around quickly. As the update to the Bicycle Element of the Master Transportation Plan attests, there’s still plenty to do. Quarterly meeting of the West End Columbia Pike Coalition. Lots of catching up to do! We look forward to seeing you. MAKE YOUR VOICE HEARD – ENGAGE IN MAKING THE WEST END OF THE PIKE AN EVEN BETTER PLACE TO LIVE! Join Us at the Tyrol Hill Park Ribbon Cutting Ceremony to Celebrate the Phase Four Project Renovations! Wednesday, August 29, 7 p.m.